At times reminiscent of the best in both Cabaret and Maus, Wakka Wakka's puppet-driven drama, Fabrik, is no less heartbreaking on its miniature scale. No strings are necessary, but it pulls all the right ones as it comes full circle in this rags-to-riches-to-rags story. At times reminiscent of the best in both Cabaret and Maus, Wakka Wakka's puppet-driven drama, Fabrik, is no less heartbreaking on its miniature scale. The play begins innocently enough, with a lighthearted song from the proud Jewish businessman Moritz Rabinowitz (David Arkema), and an introduction to some of his forty rules for success, and slowly grows darker. The first glimpse of something amiss is when socialite Mrs. Hansen (Gwendolyn Warnock, who plays all the female parts) deliberately snubs him -- in his own suit-making shop -- choosing instead to talk with Moritz's soft-spoken, Beaker-like assistant, Mr. Askeland (Kirjan Waage, who also created the puppets and masks). For a puppet, the expression on his face is quite complex -- almost as if he's eating his lower lip -- and then with only a pause of resignation, he gets back to his work. We meet his daughter, Edith, as she pirouettes through the air (a dazzling effect achieved by having one black-suited actor manipulate the hand-and-rod puppet, as another delicately adjusts the feet), and soon after, his wife, Johanna, a gentle soul driven to depression because of how ostracized they are in the community. These small details help to humanize the puppets, as does the visual presence of the actor as a shadow, a ghost-like presence that brings, for a moment, the past to life. 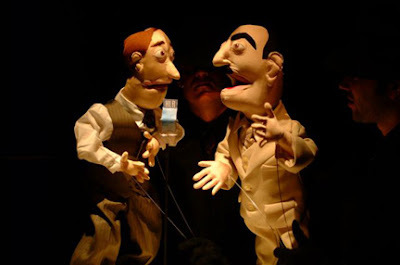 The puppets also bring a high level of visual creativity to the show: Moritz is a visionary, and he predicts early on what the rise of the Nazi part will mean for the Jews living in Norway. In one dream, he flies through the air, being chased by strafing fighter planes, and he is saved -- after some initial confusion -- by a red-capped Norwegian; in another, he plummets to the bottom of the sea, and even there he isn't safe. Furthermore, Waage's puppets have some real menace to them behind, a darkness you won't find on Sesame Street. Hitler speaks comically, but glowers with more than plastic, and Winston Churchill, who appears like a phantom from a radio tube, seems all the more real despite his intense cigar-chewing caricature. In the best scene, a masked actor, appearing as a menacing, inhuman SS soldier, holds two rods above a prisoner puppet and forces, in a sequence of meta-marionette action, that character, Fritjolf Koehler, to crack jokes ("Take my wife, please. Oh, wait . . ."). It may just be a puppet, but the tears he chokes back in a veil of bitter, forced laughter are real. Save for a repetitious song by an old man with an accordion (the antisemitism is already in plain view), Fabrik pulls every single string with real brio that I can hardly express on paper. The show comes full circle, recasting the opening number in the much harsher light of a camp in Sachsenhausen, and explodes in a moment that is both cathartic and traumatic. But more importantly, it nails one of the most tragic elements of this story: Moritz is not a Jewish businessman; he's a businessman. No, not a businessman: a man.